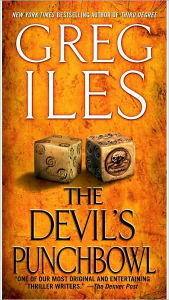 Greg Iles’ THE DEVIL’S PUNCHBOWL is the third installment of his Penn Cage novels. The first two combined suspense, mystery, and insights into the human condition and the depravity of some. Iles’ latest continues that trend as Cage, a former Houston prosecutor who returned home to Natchez, MS to raise his daughter Annie after his wife passed away from cancer. Cage turned to writing and became a successful novelist, but local demands saw him become involved in a major civil rights case, a twisted drug case, and of course a murder investigation. After witnessing how his hometown had deteriorated he decided to run for mayor and defeated his arch enemy Shad Johnson the sitting District Attorney. Cage’s hope was to resurrect the city he loves, but after two years in his term he concluded that reforming education and municipal corruption was beyond his power. His idealism faded as the political reality set in. The novel opens as Cage meets with an old school friend, Tim Jessup, a recovering drug addict who was working at one of the floating casinos, the Magnolia Queen. They meet late at night in the town cemetery where Jessup discloses that the casino operators are involved with a number of illegal activities ranging from dog fights, prostitution of underage girls, money laundering, and tax fraud. This knowledge heightens Cage’s disgust and vows to resign his office. However, when Jessup turns up dead and his house has been trashed he realizes that he is up against an organization that will kill anyone that gets in the way of their activities. Cage knows he is up against something or someone that he has few resources of which to confront. He is uncertain who on the Natchez city police or the county police he can trust. He turns to his father, Dr. Tom Cage, and a group of paramilitary types led by Don Kelly, an ex-special forces operative in the Marines as well as his cohorts to save his family and pursue justice. Dr. Cage also brings in Walt Garrity, a former soldier and Texas Ranger, that he had fought with during the Korean War to assist his son. Cage also has worked with Danny Kelly, a former army special ops in Afghanistan who brings his Blackwater type organization with him to assist the mayor of Natchez since he cannot trust his own law enforcement apparatus. The reader enters the casino world with its ancillary activities of money laundering, dog fighting, and political control, and if anyone threatens their agenda they seem to disappear if they stand in the way of what they are trying to achieve. People like Seamus Quinn and his boss Jonathan Sanders are the epitome of ruthless operatives of which Cage must contend. Included in this menagerie of criminals is Edward Po a Chinese corporate type who seems to be in charge, but is also a target of the Department of Homeland Security as represented by Special Agent William Hull. Ile’s has strong opinions of the plight of the southern gulf coast and those individuals and groups, be it Asian or American who threaten to destroy his tranquil southern lifestyle. Ile’s is also concerned about the educational bureaucracy that exists in his home state of Mississippi and its negative effects on the state’s future. As Cage tries to deal with the situation characters from his previous books reemerge, i.e. Caitlin Masters the newspaper publisher and a woman he lived with for five years; Police Chief Don Logan, and the network of individuals that Cage worked with when he was a prosecutor in Houston. One aspect that Iles’ introduces in his writing is the history of Natchez over the last century and how it impacts the current situation. It gives the reader insights into southern culture and the accepted way of doing things. For Penn Cage his frustration with the existing American legal system is something he is about to give up on. The book also provides a window to international organized crime, particularly the Chinese variety and the strategies employed by the American justice system. This is the third book in the Penn Cage series and is by far the best one. Ile’s has the ability to grab the reader’s attention from the outset, and if you decide to read any of his work make sure you have set aside enough time for the task because once you become involved in the plot line it will be very difficult to put the book down.